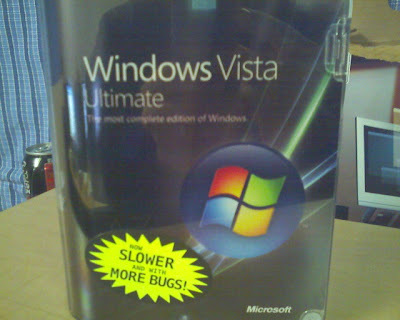 Dear reader Mike sends in this photo of an accurately labeled box of Vista and wants to claim his prize. Seems to have been taken at home rather than in a big box store, however. Well, I’ll let you decide whether Mike gets a reward. » HP’s flack, spied upon, says: Thank you, ma’am, may I have another?